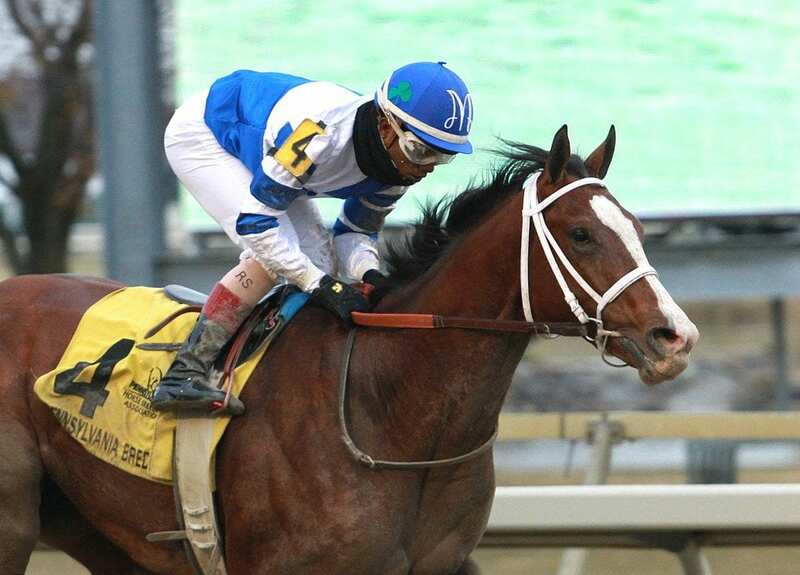 Prince Lucky won the Pennsylvania Nursery Stakes. Photo by Bill Denver, Equi-Photo. Four horses that broke their maidens in the mid-Atlantic are scheduled to face the starter in Saturday’s Grade 3, $200,000 LeComte Stakes at the Fairgrounds — the race that kicks off the 2018 road to the Triple Crown. The event has attracted 15 three-year-olds, including one filly, the multiple graded stakes-winning filly Wonder Gadot, 6-1 on the morning line. Trainer Steve Asmussen sends out the morning line favorite here, Principe Guilherme (5-2), a $600,000 Tapit colt who’s won his two starts by a combined 17 lengths. Trainer Larry Jones has a trio of runners who broke their maidens at Delaware Park ready for this event. Breaking from post five under Brian Hernandez, Jr. as the co-third choice at 6-1 morning-line odds is Kowboy Karma, who is owned by the trainer in partnership with wife Cindy and Michael Pressley. The son of Kodiak Kowboy was an emphatic winner of his career debut at Delaware Park when he took a six-furlong maiden event by 12½ lengths. Such an effort was followed by a stakes victory at the Delaware oval in the Strike Your Colors Stakes on Aug. 10, which was his last victory. Since then, he finished second in the Sapling Stakes at Monmouth Park on Sept. 2 behind multiple stakes winner Bal Harbour. His next outing was a close fourth-place finish in the Gr. I Champagne Stakes at Belmont Park on Oct. 7 behind Firenze Fire, Gr. I Breeders’ Cup Juvenile winner Good Magic and Nov. 25 Gr. II Kentucky Jockey Club winner Enticed. Last out, he was second beaten two lengths in Laurel Park’s James F. Lewis III Stakes on Nov. 11. Breaking just to the outside of Kowboy Karma from the six-hole at odds of 15-1 is regally-bred stable mate Believe In Royalty. Owned by Brereton Jones, William Mack and Robert Baker, the son of Tapit is out of 2012 Kentucky Oaks winner Believe You Can, who also was trained by Jones and prepped for her Oaks triumph at the Fair Grounds. Believe In Royalty broke his maiden second time out over a sloppy going at Laurel Park on Oct. 9 and returned to victory around the Maryland oval next out in a one-mile allowance event on Nov. 19. Following his pair of Laurel triumphs, he shipped to Oklahoma to face stakes company for the first time in the Remington Springboard Mile on Dec. 17, but was a troubled sixth and finished 14 lengths behind winner Greyvitos. Jockey Robby Albarado was aboard for that effort and will return to the irons for the LeComte. The last of the Jones trio is Pennsylvania-bred Prince Lucky who breaks from post 12 under Julien Leparoux at 8-1 odds. Owned by Daniel McConnell, the son of Corinthian made his career debut a winning one over Delaware Park’s main track in an Aug. 28 maiden event which he won by 5¾ lengths. Next out, he returned to racing action over the Delaware oval but was handed the only loss of his career in the First State Dash Stakes. His next two starts resulted in trips to the winner’s circle and took place at Laurel Park in a six-furlong allowance race which he won by 3¾ lengths and followed that win with a stakes victory against fellow Pennsylvania-breds in the Pennsylvania Nursery Stakes on Dec. 2. Among their rivals will be a Mike Stidham-trained runner who broke his maiden at Laurel Park. Bossci Stable’s Zeke is unbeaten in both of his career starts. He broke his maiden over a fast main track at Laurel Park on Oct. 14 in a race taken off the turf and then won off of a two-month layoff in a Fair Grounds allowance race over the Stall-Wilson Turf Course on Dec. 10. The son of Gio Ponti will be ridden by Joe Bravo, who was aboard for his most recent victory. Zeke will break from the nine-hole at odds of 15-1.